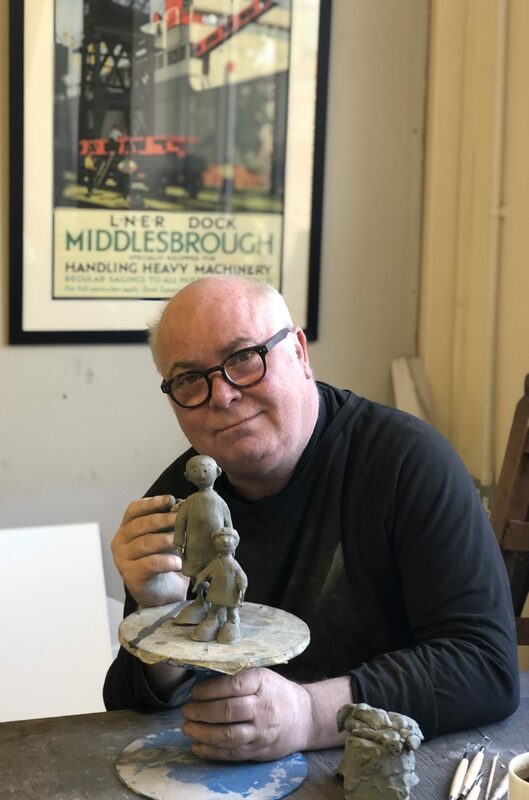 Middlesbrough born artist Mackenzie Thorpe is inviting members of the public to the unveiling of his sculpture ‘Waiting for Me Dad’ at the Tees Transporter Bridge on Tuesday 9th April at 11.30 am. The much-anticipated bronze sculpture, inspired by the painting of the same name, sees two children standing on the Middlesbrough side of the river waiting for the gondola to return and bring their father home after a hard day’s work in the industry of the area and is a nostalgic look back to the artist’s own childhood memories. Mackenzie wants to ensure that the daily contribution to Middlesbrough’s success by normal, everyday people is celebrated, acknowledged and not forgotten. The sculpture has been created by Mackenzie as part of the artist’s 30th year celebrations and the launch event promises to be both moving and inspirational. The sculpture will come to life in the shadow of the bridge as members of the community are joined on the Transporter by Middlesbrough Mayor, Dave Budd and Middlesbrough Council chief executive, Tony Parkinson, who will cross the Tees to meet Mackenzie and the unveiled sculpture for the first time. The event will include a performance from the Infant Hercules choir, led by Mike McGrother singing local Middlesbrough-inspired songs including An Ordinary Man in tribute to the men who used the bridge for work, the song reaching a crescendo as the gondola arrives at the sculpture. In this his 30th year as well, as the sculpture placement Mackenzie is donating the original painting of ‘Waiting for Me Dad’ to the town and is encouraging everyone to come down to the Transporter Bridge and gather at the visitor centre to join in the celebrations. “I have really strong memories of my childhood growing up in Middlesbrough; that sense of industry seemed to be everywhere. Men worked in the shipbuilding or the steel works or ICI or the docks and for me the Transporter is a proud symbol of everything that is good about our town. In my own way I wanted to acknowledge that time, when it was normal for droves of men cross the river daily to work long hard shifts and families waited for their return, the men did it to put food on the table, and the sculpture depicts the children waiting for their return. The piece is an acknowledgement of that time, of the industry and the men and their families who helped shape our town. The Transporter Bridge features prominently in many of Mackenzie’s pictures and he once worked in the shipyards on the Tees before he became an internationally-renowned artist.